MPs are waiting to see if English Heritage will step in to protect Art Deco features at their local pub before it is demolished. The Paviours Arms in Westminster will close on Thursday because the office block of which it is a part is being redeveloped into flats. 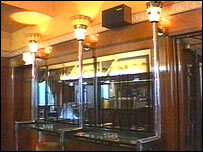 Dating back to 1937, it is thought to be London's most complete Art Deco pub. And as it is within walking distance of the House of Commons, it is a favourite with politicians and civil servants. Its fate has already prompted an Early Day Motion tabled by 41 MPs, who now hope English Heritage will list the pub to protect its interior. Colin Challen, MP for Morley and Rothwell, told BBC London: "The interior, I think, is certainly quite unique so I am hoping that English Heritage will give us a very positive assessment." But the interior is not entirely original and owners Land Securities Trillium say the block is of "little architectural merit". They say are happy to work with anyone wanting to preserve Art Deco features before the redevelopment. But the demolition is scheduled to go ahead - Westminster Council says the planning application has been properly processed and the owners will not reconsider.